Business owners and marketers get that they need content. The idea has been drummed pretty hard the last few years so now they blog, pay others to blog and upload all manner of “how to” video to YouTube. The problem with simply embracing the need to create lots of content is that this mentality misses a great deal of the point of content. The point of content is to get people to understand you have something that might just make sense for them, that you know what you’re talking about and that your approach can be trusted above all others. Until you create that kind of content everything else is just noise and pixie dust droppings for the SEO gods. In my work with small business owners I’ve identified three workhorse pieces of content that must be in place to help meet the objectives above before any amount of blogging and tweeting can do what you want it to do. The first is something I call Your Talking Logo. Some might call this a USP or elevator pitch, but I’ve always had a little different take on it. The proof – The proof is simply your prepared response to the obvious followup statement any sane minded contractor is going to ask after hearing that Talking Logo – “Really, tell me more about that.” So this is the point where our architect gets to tell the contractor that three of his associates are on suburban city councils and zoning boards so they have a far greater understanding of red tape than any other architect in town. This formula is of course based on the fact that they’ve narrowly defined their ideal client and, in working with this ideal client, been able to clearly identify the thing that actually does make them different. Until you nail those two elements and then capture a way to communicate them as elegantly as above, your content will never have the focus and clarity it needs. The case statement is a tool I borrowed from the non-profit world because it just makes so much sense. In fundraising circles it’s common to “make a case” for why you should donate. If you think about it, isn’t that what you do everyday – make a case for why someone should exchange their dollars for the value you’re offering? The case statement expands on Your Talking Logo to help paint a much grander picture and make a case for choosing you. A well written case statement might make some of the best website home page content possible and certainly is the formula for pitching your business in face to face settings. Challenge – First off describe or frame the challenge in terms that clearly resonate with your ideal prospect – it’s the number one thing you solve because it’s the number one thing your clients come to you for. Paint a better picture – Next let them dream a bit by giving them a view of what the world could be like for them if this challenge went away – here you’re going to address the goals and objectives you know they wish they had in their lives. How they got there – Okay, now it’s time to give them a little relief. You know how they got to where they are right now so let’s identify the villain, let them off the hook, let them know they’re not alone and maybe it’s not even their fault. You know this because you’ve seen it many times, right? What if . . . – Now it’s time to dangle the fact that they actually could get relief, that there is a solution and by the way you have it and it’s worked perfectly for lots and lots of folks just like them. Call to action – Now that they’ve traveled on this journey with you it’s time to tell them what to do next. End your case statement with a direct call to sign up for your killer demo, create a trial account, get some other form of content or attend a session where they can see what you offer in action. The case statement is an educational tool that demonstrates to your reader that you get them and you have a completely different way of addressing their challenge. Create this tool and let it inform your presentations and product pitches from here on out. The final “must have” content tool is something I call your point of view eBook. 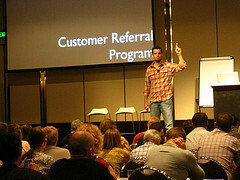 This is the tool that anchors your selling efforts by teaching people the precise method you use to get them a result. I’ve used an eBook I call 7 Steps to Small Business Marketing Success for going on a decade now and it’s the single most important piece of content I’ve created. It’s been downloaded several hundred thousand times and helped me create a common language for my readers, customers and ultimately the independent marketing consultants who now install the Duct Tape Marketing system. It works for me, not because it’s such a fantastic piece of writing, because it allows me to clearly expand upon my central point of difference in a way that’s tuned for someone who has been attracted to my core message of a marketing system and is now ready to dig in and learn just what that might mean to them. This is my methodology laid out for all to see and it is the context for the rest of the content I produce on a daily basis. This is my point of view about marketing expressed in about twenty pages, but it also acts as the foundation and filter to guide my blog posts, presentations, other eBooks and ultimately product and course offerings. When you start to view everything you do, create, sell and describe in your business as cascading from the one simple bit of strategy defined in Your Talking Logo, you can start to get the very clear picture of how to build a powerful narrative for your brand using content – one that keeps your ideal prospect firmly rooted on the path to becoming your ideal customer.